You've already read and reviewed The Christmas Bride, Hils?!? Really!?! I just reminded you it came out on Tuesday! How do you do it? LOL. Ahh, the wicked, hardened step-mother/woman as a heroine bit. I think it made for a good/different sort of Christmas read. If you haven't read A Precious Jewel yet, then it might not have as much of an impact on you... read that book afterward! That's a plan! I read it a while back, but never reviewed it (I was too caught up in A Matter of Class at the time). I just love this author!!! 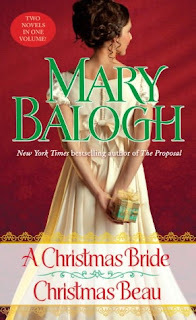 I haven't read any of her christmas stories though...so this one is definitely going on my TBR list!!! Thanks for the lovely review!!! I remember I went through a Balogh kick a few years ago and I read this one, and yeah, it was rather different from others, but in the end I really like it too. She's a great author. Alex, are you feeling better? I'm glad you're back! This IS a bit different, right? I think I liked most because of that... and because Balogh made it work. And yeah... I do enjoy her work. Christine, I collect Balogh's work in print, and these re-releases of her old works (Signets) I think are worth collecting since originals are so hard to find. :) This is a good one to buy... both stories are different from the "usual" Balogh.